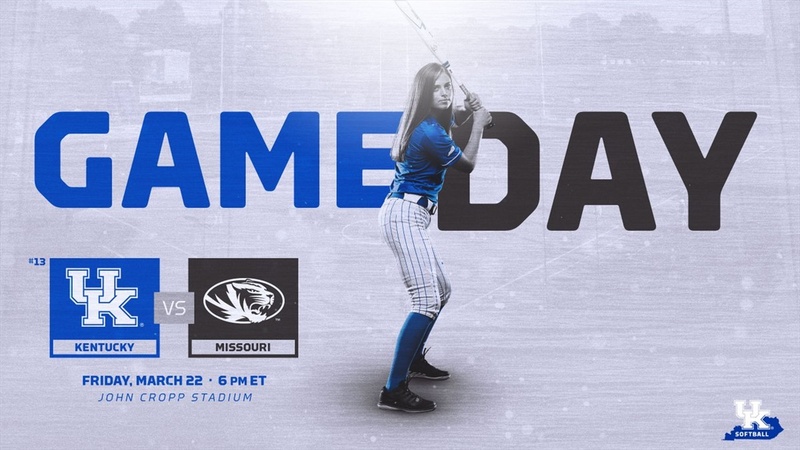 Kentucky hosted Missouri Friday night at John Cropp Stadium. With Missouri scoring six unanswered runs Kentucky saw their 12-game winning streak end with a 10-8 Missouri win. Kentucky falls to 6-1 in SEC play. Missouri would get on the board first with two runs off a Kim Wert home run. (Mizzou 2, UK 0). Sarah Rainwater would drive in Katie Reed and Lauren Johnson would connect on a home run to right field to put Kentucky up top. (UK 3, Mizzou 2). Missouri would score twice on a home run by Jazmyn Rollin to take the lead back. (Mizzou 4, UK 3). Kentucky would score three times in the third, Kelsee Henson hit a two run double scoring in Jaci Babbs and Katie Reed and Jenny Schafer tripled to bring Henson home. (UK 8, Mizzou 4) Missouri would tie it up as they sent 10 batters to the plate and got four runs. (Mizzou 8, UK 8). Missouri would get back to back doubles to score twice and take the win.